In one of my longer blog posts last year (link here), I detailed the convoluted and complicated history of the TROPICANA Hotel/Casino trademark – a fascinating look at how trademark rights are handled in the course of multiple large scale corporate transactions (including bankruptcy proceedings) and how certain things can (and indeed do) fall through the cracks. What started out as a simple declaratory judgment action in Nevada state court by the new owners of the Tropicana Hotel & Casino in Las Vegas regarding their long-time right to use the name Tropicana in connection with that specific hotel/casino located at the intersection of Las Vegas Blvd. and Tropicana Avenue blew up into an epic lawsuit filed in Delaware Bankruptcy Court by a group of companies lead by Carl Icahn's Tropicana Entertainment Inc. The matters had been fully briefed by both sides and were awaiting a court hearing. But alas, now we’ll never know how exactly the bankruptcy court would’ve unraveled the convoluted trademark issues raised by Tropicana Entertainment’s adversary proceeding (we know how the Clark County District Court decided those issues, but that is in part what led to Tropicana Entertainment to file the adversary proceeding it did in bankruptcy court). As reported by VegasInc’s Steve Green (link here), the parties announced in mid-August that they had reached a Settlement that resolves the outstanding trademark disputes and which provides for an agreement regarding concurrent use by both parties of the mark TROPICANA. A copy of the Settlement Agreement, with all of its provisions regarding concurrent use of the Tropicana name by the respective parties, can be viewed here. and clarifies that in any other logos used by Tropicana Las Vegas, the Las Vegas (or LV) portion of the mark shall not be smaller or less prominent in proportion to TROPICANA or TROP than as reflected in the above logo. 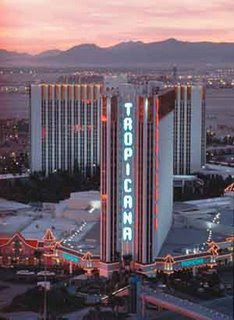 As for what Tropicana Entertainment gets out the deal, it gets the exclusive rights to use TROPICANA and TROP, but provided that it also is accompanied by some other mark indicating either a geographic location (other than Las Vegas obviously) or some other mark to identify services currently offered by Tropicana Entertainment (e.g., Tropicana Advantage). The Agreement also deals with how the parties will handle present and future trademark registrations for marks using TROPICANA, use of their respective marks on the Internet, and issues relating to enforcement of rights in their respective territories. By entering into this Settlement Agreement (with concurrent use provision regarding the trademark rights), the parties certainly ended up doing the smart thing in reaching an amicable settlement – bringing to a halt a dispute that had likely cost the parties millions of dollars in attorney fees and costs (fees that would have continued to be incurred given the high stakes) and doing so in a way that brings certainty to the rights of the parties moving forward. And it was probably the fair outcome given the long-time association that the world does have with the name Tropicana in connection with that particular hotel in Las Vegas while at the same time recognizing Tropicana Entertainment's investment in the name outside of Las Vegas. Of course, at the same time, it would’ve been interesting to see which way the bankruptcy court would have sided in this dispute (and the legal rationale for such decision). 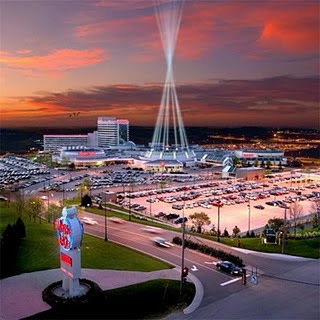 As first reported by Steve Green, Mystic Lodge casino in Henderson ("Mystic Lodge") lost its trademark dispute with the Mystic Lake Casino Hotel in Minnesota ("Mystic Lake"). This case was first discussed on this blog here. In a July 25, 2011 order, U.S. District Judge James Mahan issued a Final Judgment and Permanent Injunction against Mystic Lodge ordering it to change its name. The chips were stacked against Mystic Lodge from the beginning of this case. Not only are the two marks, Mystic Lodge and Mystic Lake substantially similar, but both marks are for the same services. Moreover, the senior user, Mystic Lake has been using its servicemark for almost twenty years and has multiple federal registrations. Although a small Henderson, Nevada casino with no hotel and a large Minnesota Indian hotel casino resort may seem worlds apart, the Minnesota tribe which runs Mystic Lake argued in its Motion for Summary Judgment that both casinos operate on a national level and compete for the same customers. [T]he undisputed evidence supports the conclusion that Mystic Lake Casino and Mystic Lodge Casino operate in a market that includes a nation-wide consumer base. First, more than 100 of the same individuals appear in both Mystic Lake Casino and Mystic Lodge Casino’s respective player databases… Mystic Lake and Mystic Lodge also have player databases that include residents of all 50 states… Both Mystic Lake and Mystic Lodge casino services expressly cater to travelers and tourists… In fact, both parties have thousands of customers in Nevada alone…. Simply put, [Mystic Lake] and [Mystic Lodge] compete for the same discretionary consumer dollar—Mystic Lodge is a competitor of Mystic Lake. Mystic Lodge attempted to argue the Dawn Donut rule as a defense to the issuance of an injunction against it. That rule, first set out in the case Dawn Donut Co., Inc. v. Hart’s Food Stores, Inc., 267 F.2d 358 (2d Cir. 1959) provides a defense to the issuance of an injunction against a good faith junior user of a trademark which adopts the mark without knowledge of the federally registered mark and which operates in a geographically separate and distinct trading area to the senior user. Judge Mahan however, ruled that the Dawn Donut defense was not applicable to the facts before the court because Mystic Lodge had actual knowledge of the federal registration for Mystic Lake, but decided to adopt the mark anyway. The defendants argue under Dawn Donut that when two marks are confined to sufficiently distinct and geographically separate markets, without evidence that the registrant will expand to the defendant’s market, the plaintiff is not entitled to enjoin the junior user’s mark. See 267 F.2d at 364. Further, the “injunctive remedy does not ripen until the registrant shows a likelihood of entry into the disputed territory.” McCarthy, supra, at § 26:33. In the alternative, the defendants’ assert that there is a presumption of good faith since an opinion letter from counsel permitted the use of the mark. The court disagrees. Here, the Dawn Donut defense does not apply to the plaintiff’s ability to receive injunctive relief due to the bad faith shown. The defendants received actual knowledge of the plaintiff’s registered mark through counsel, ignored requests for alternate names, and disobeyed express recommendations on how to limit the possibility of infringement. Although the final opinion letter by counsel timidly approved the use of the mark with certain limitations, the email from counsel advising that the mark was already registered and the senior user would aggressively protect it disallows the final opinion to serve as a rubber stamp for the defendants’ actions. “The Ninth Circuit does not . . . insulate the defendant from a finding of willful infringement based on advice of counsel of noninfringement.” Monster Cable Prods., Inc. v. Discovery Commn’s, Inc., No. C 03-03250, 2004 WL 2445348, *9 (N.D. Cal. Nov. 1, 2004) (citing Wolfe v. Nat’l Lead Co., 272 F.2d 867, 871 (9th Cir. 1959). The lesson, of course, is to follow the recommendations of your attorney. Moreover, if you are willing to spend the money to get an attorney’s opinion about potential trademarks, use the advice to pick a name that (1) not federally registered and (2) is not the name used by a competitor in the United States for the same goods and services you want to sell. (e) Registering and/or applying for any trademark registration for a Mystic Mark. The Judgment also gives Mystic Lake sixty (60) days to provide written confirmation that it is no longer using the Mystic Lodge mark and transfer all domain names which include the Mystic Lodge Mark to Minnesota casino. If a stay is not granted, Defendants face the risk of being put out of business complying with a permanent injunction before having been ultimately found by a jury not to have infringed upon Plaintiff's mark. Equally important, Plaintiff will not be harmed by a temporary stay of the permanent injunction pending appeal. Of course Mystic Lodge can simply change its name and re-brand its business. While such a move may be expensive, so is an appeal to the Ninth Circuit Court of Appeals. This case once again highlights the importance of local Las Vegas businesses obtaining national trademark protection for their brands. Mark Borghese is a Las Vegas business attorney with the law firm of Borghese Legal, Ltd.